How about a train ride with Santa and Mrs. Claus this year to make your Christmas extra special?! Tickets sold exclusively at Whistle Stop Hobbies. All trains depart promptly from King Street Station in Alexandria at 1:25pm and includes round trip travel to Old Town Manassas returning to King Street Station at 3:30pm. Monday, December 3rd – SOLD OUT! Monday, December 10th – SOLD OUT! Friday, December 14th – SOLD OUT! Monday, December 17th – SOLD OUT! 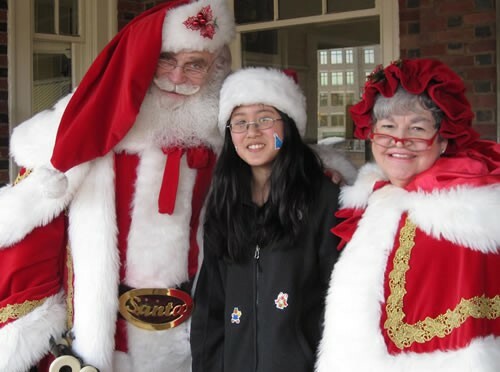 Santa and Mrs. Claus will be on board to greet children with a special holiday treat! When we arrive in Manassas we leave the train for approximately 30 minutes. During that time we will be serving Hot Chocolate and Cookies. Hooray for Books will have a store time in the station and Santa will hold a Q&A session on the station platform. We made the news in 2016! Check us out HERE on the Old Town Alexandria Patch! We were featured on The Washington Post! Check out the great photos HERE.